Obituary – Smith, Esther « Perry High School Alumni Association, Inc.
Esther Leona Smith, 81, of Perry, Oklahoma, was the daughter of George Walter and Leona Boyd. She was born on August 21, 1921 in Ripley, Oklahoma and died Thursday evening, July 17, 2003 at Perry Memorial Hospital. Esther married William Smith on April 2, 1941 in Perry, Oklahoma. She enjoyed gardening, being a homemaker and attending to peoples needs within the community. Esther was a member of the Zion Lutheran Church, where she was active in WELCA and the Golden Circle. She was a member of Disabled American Veterans. 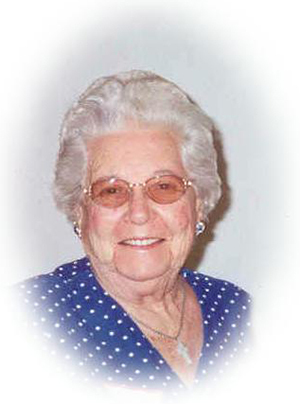 Esther was a volunteer at Green Valley Nursing Home and at the Oklahoma Blood Bank. She was given a Certificate of Appreciation from the Oklahoma Blood Bank for her service with them. Funeral services will be 2:00 p.m. Monday, July 21, 2003 at the Zion Lutheran Church with Rev. Ben Mirtz officiating. Interment will be at the Zion Lutheran Cemetery under the direction of Brown-Dugger Funeral Home. There will be a family visitation from 6:00 to 8:00 p.m. Sunday, July 20, 2003 at the funeral home. Memorials may be made to the Zion Lutheran Church Memorial Fund in care of Brown-Dugger Funeral Home. Esther is survived by her husband, William Smith; one son, Billy Joe Smith and his wife Sally, of Dallas, Texas; two granddaughters, Elizabeth Smith and Hillary Smith Garrett, both of Dallas, Texas; two step-grandchildren, Vanessa Ogel and Steven Ogel, both of Dallas, Texas; one sister, Nina McLemore of Stillwater, Oklahoma and numerous nieces and nephews. She was preceded in death by one daughter, Sherry Leona Smith, her parents, one brother and one sister.